Greens Senator and animal welfare spokesperson Lee Rhiannon spoke at the rally. Read her full speech below. “The nationwide Oscar’s Law Puppy farm awareness rallies will play an important role in achieving new rules to protect companion animals. “I congratulate Animals Australia and all those involved in these rallies for bringing this issue to the attention of the public. “The Greens support restricting animal breeding and sales to registered breeders. It is time to end the market for animals bred in puppy factories and we can achieve that by banning the sale of dogs through pet shops and markets. “Companion animals bring great joy to so many Australians. We can ensure the safety and welfare of our companion animals by supporting rules that allow a more responsible level of engagement between breeders and owners of dogs. Thank you to Pixie Robertson for allowing her photo to be published. I do acknowledge traditional owners of the land on which we meet and pay tribute to their history, culture and ongoing commitment to our communities. On behalf of the Greens thanks for the invite to speak today and congratulations to the organisers of this wonderful event. The Greens support Oscar's law. Rallies like our one today in Sydney are being held in Melbourne and Adelaide. My colleague Greens MP in South Australia has been inspired by Oscar's law and is working with MPs from other parties to win support for her Bill to ban factory farms and make micro chipping compulsory. Yesterday I was at Eastgardens shopping centre to see a movie. The first shop I came to as we entered was a pet shop. There were many cute little puppies in the window. Children were taking delight from the little furry bundles and excitedly talking to their parents. This is not the way to sell puppies. We should not pick up a delightful little pet puppy coming out of the movies or when we are in a shopping centre. Animals have rights and we can honour those rights by ensuring that when people purchase their pet they know that it has come from a registered breeder. Companion animals bring people so much joy, but for the animals it is not always a happy story. As I looked at the little puppies in the pet shop I couldn't help but think of Oscar, the little puppy that was rescued twice from a puppy farm - these farms that breed stock for these pet shops are proliferating. 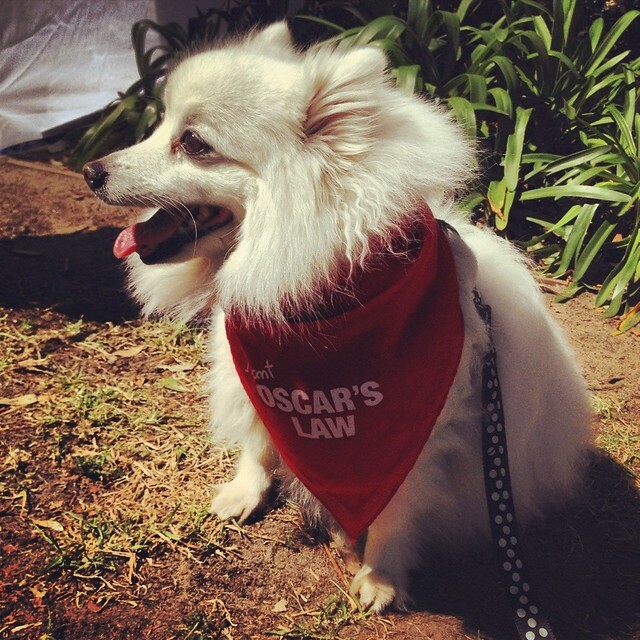 Oscar's story reminds us why today's rally is needed and why puppy farms should be banned. Oscar ended up severely malnourished, his hair matted and his skin blistered. The physical and psychological torture of puppies raised in this way is extreme. Dogs like humans are naturally social creatures. We evolved together and our social needs are very important. Puppies caged up for the formative first weeks of their live are left traumatised. The cruelty extends to the mothers of these puppies. Most of the breeding stock is put out to breed every time they are on heat. The physical pressure on these dogs is extreme. I have heard worrying reports about some dogs losing their uteruses because of the endless breeding. It does not have to be this way. Banning puppy farms and requiring all puppies to be bought from breeders registered with the Australian National Kennel Council is the way to go. This is the message from Animals Australia and RSPCA who with many others have worked so hard to change the law. I particularly wish to congratulate Clover Moore who has taken this campaign into the NSW parliament. We were fortunate to hear from Clover today as a MP. On Thursday she will be forced out of the job by the Coalition by what is widely called the get Clover law. The Greens in NSW are committed to continue Clover's work to ban puppy farms. I am here today with former Sydney City Councillor, Chris Harris, who is standing for seat of Sydney. If elected I look forward to working with Chris and the other NSW Greens MPs to continue to work to ban puppy farms. How often are we told that dogs are a man's - people's - best friend? That saying has become embedded in the English language for good reason. All of us here today have experienced the love and devotion of our best friend. Now it is time we returned that friendship and banned puppy farms.